After the March 15 attacks on two mosques in Christchurch, New Zealand, we feel compelled to come to the aid of those communities, just as our Jewish community was so compassionately supported only a few short months ago by people around the world of many faiths. 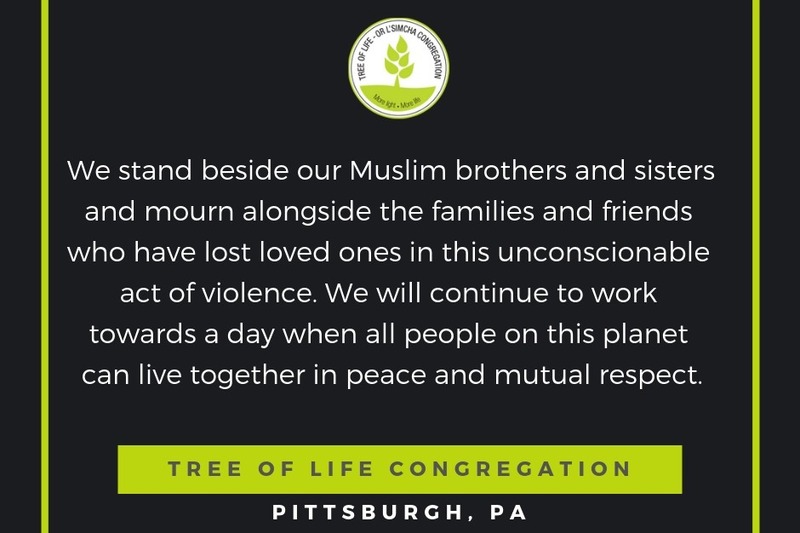 We recall with love the immediate, overwhelming support Tree of Life received from our Muslim brothers and sisters in Pittsburgh. As we extend our deepest condolences to them and their fellow Muslims in New Zealand, Tree of Life has established a GoFundMe campaign to support the victims and their families of the mosque shootings in Christchurch, in an effort to comfortthe suffering Muslim community thereand promote its recovery. Currently, we know that 49 worshipers were killed and at least 20 were injured following two shootings at the Al Noor and Linwood Mosques. We know this event was motivated by H*. Tree of Life members, and our friends who continue to comfort and bolster us as we recover, must now come together to support the Muslims of Christchurch. Please share this page with your families, friends and neighbors. Make a donation, and leave a kind message of hope to let them know that the entire world is with them. Tree of Life will work with GoFundMe to ensure that all funds are transferred to an organization authorized to provide support to the Christchurch families and community. All funds are being safely held by GoFundMe.org in the meantime. We will provide additional information about the distribution of funds as soon as it becomes available and we are actively researching the appropriate organizations in New Zealand to receive the money that we raise. GoFundMe.org is an independent, public charity in the United States. Your donations may be tax-deductible if you are a U.S. donor; donation receipts will be emailed after the campaign ends. Show them that love is stronger than H*. 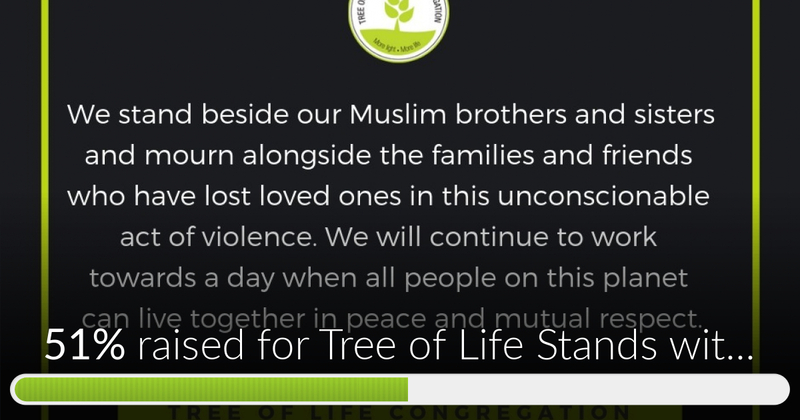 Tree of Life Stands with the Christchurch Mosques has reached 51% of its goal. Thanks to Dave, Sandy and Mildred.